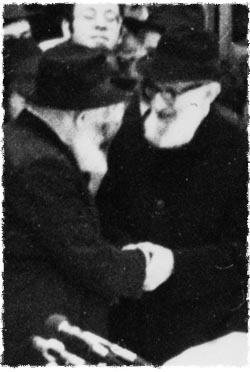 Rabbi Joseph B. Soloveitchik is greeted by the Rebbe at a gathering in Lubavitch World Headquarters. I had the opportunity to facilitate a meeting between the Rebbe, Rabbi Menachem Mendel Schneerson, and Rabbi Joseph Ber Soloveitchik, "the Rav," at a sad time. It was 1964. The Rebbe's mother, Rebbetzin Chana Schneerson, had passed away on Shabbat, four days before Yom Kippur, and the Rebbe was sitting shiva. The usual seven days of mourning were cut short, as the holy day of Yom Kippur fell on Wednesday, bringing shiva to an end. Every year during the Ten Days of Repentance,1 the Rav would deliver a rousing lecture on the laws of repentance which thousands of people would attend. That year, the Rav presented the lecture on Sunday night and it was my privilege to attend. When the Rav entered the hall with his family, I quickly approached him and carefully told him the sad tidings. I offered to drive him to the Rebbe if he chose to pay his respects and comfort him. He was very grateful and said to meet him at the end of the lecture to finalize the arrangements. He asked me if I would be available the following day, Monday, at 1:30 in the afternoon. "Certainly," I said, and we arranged for me to pick him up at Yeshiva University. There was a daily afternoon service at the Rebbe's mother's house at 3:30 in the afternoon. I surmised that we would arrive in time for the prayers. It sometimes happened that the Rav would make an appointment which, because of poor health or other personal matters, he had to cancel. Therefore I did not inform the Rebbe's secretary that Rabbi Soloveitchik would be coming. Only after we set out from Yeshiva University did I stop at a gas station and call the Rebbe's secretary, Rabbi Leibel Groner. I felt it was important for him to know that Rabbi Soloveitchik would be arriving and should be ushered in immediately. At the same time, I also called several friends, rabbis who were close to Rabbi Soloveitchik — Rabbi Israel Miller, Rabbi Hershel Shachter of Mosholu Parkway Jewish Center among others — and invited them to join us. The journey from Yeshiva University to Crown Heights took over an hour, affording me lots of time to discuss the Lubavitcher Rebbe with the Rav. During the discussion, I asked the Rav to tell me about the Rebbe as a person, his imposing character, his personality, his great Torah scholarship, as well as his relationship with him. The Rav told me that he was a great admirer of the Rebbe. He said that their relationship began when they met in Berlin where they were both studying at the University of Berlin. During that period, they would often meet at the home of the Torah scholar Rabbi Chaim Heller.2 It was in the course of these meetings that a strong friendship developed between the two men, both of whom were destined to become outstanding spiritual leaders of the century. The Rav recalled that the Rebbe always carried the key to the mikvah (ritual pool) with him when he attended lectures at the university. "At about two or three o'clock every afternoon when he left the university he would go straight to the mikvah. No one was aware of this custom and I only learnt about it by chance," the Rav said. "On another occasion, I offered the Rebbe a drink. The Rebbe refused. When I started pressuring him I understood that he was fasting that day. It was Monday and the Rebbe was fasting. "Imagine that," Rabbi Soloveitchik said to me, "a Berlin University student immersed in secular studies maintains this custom of mikvah and fasting! "Studying together with us in the university at the time were other Jewish students from other communities. Some of them are considered today to be famous Torah giants. In the university they behaved the same way as other university students, but the Rebbe behaved like a Jew from Warsaw or from Russia. Berlin made absolutely no impression upon him at all. "This made a huge impression on me. Additionally, the Rebbe had an amazing memory." The Rav described the Rebbe's memory as "gevaldig" (astounding). "In all my life, I never encountered someone with such a memory." Then the Rav proceeded to describe his understanding of the Rebbe's Torah scholarship. "Those of us who emanate from Brisk3 don't adhere to the pilpul [in depth, longwinded debated study] system perpetuated in Poland," the Rav said. "But the Rebbe has a gevaldiger (astounding) comprehension of the Torah." The drive came to an end as we arrived at our destination on President Street. Many distinguished rabbis had gathered there to console the Rebbe. However, as soon as they heard that Rabbi Soloveitchik had arrived they immediately cleared the way for the Rav and we both went straight through to the small room where the Rebbe was sitting. At that particular moment, two heads of Yeshivahs, Rabbi Yitzchak Piekarski, whom I knew from Poland and later in Queens, and Rabbi Mordechai Mentlick were sitting with the Rebbe. Several Lubavitcher administrators were also present. As soon as the Rav entered the room, the Lubavitcher Rebbe rose from the low stool he was sitting on. As the Rebbe sat down again, Rabbi Soloveitchik was presented with an armchair especially brought in for him to ease his back pains. The question was, "may a kohen (priest) who is an onen eat teruma5?" "The Rambam (Maimonides) speaks about this issue," the Rebbe said. Rabbi Soloveitchik responded that he does not recall the Rambam addressing this matter. "Yes, yes," the Rav said. "I believe you are right, Lubavitcher Rebbe." As I stood on the side listening, what really amazed me was the way in which the two men were discussing texts with each other and the ease with which they tossed out references without ever actually citing the words themselves. The shiva call lasted close to two hours. I could not hear the entire conversation because Rabbi Soloveitchik and the Rebbe sat very close to each other and spoke very quietly. Also, I stood behind Rabbi Soloveitchik and the high back of his armchair prevented me from hearing everything that was said. Several weeks later, I returned to Yeshiva University where I met the Rav. He told me that the Rebbe had sent him a thank you letter for coming to comfort him. In the margin of the letter, the Rebbe asked Rabbi Soloveitchik's forgiveness for the fact that he had referred to the Rambam when his intention was not to the Yad Hachazaka — which is routinely known as "the Rambam" — but to the Rambam's commentary on the Mishnah. The Rebbe said that it is forbidden for a person to express words that cannot be clearly understood. "Only the Lubavitcher Rebbe manifests this phenomenon in his character with his ehrlechkeit (honesty and gentleness)," Rabbi Soloveitchik said. "There's no other person like him. Another person would have dropped the issue, but the Rebbe, a man of truth, apologized to me. Moreover, he asked my forgiveness." Sometime later, the Rebbe's mother-in-law passed away. His wife, Chaya Mushka and her sister, Chana Gurary, were sitting shiva at the residence of the deceased on the upper floor of 770 Eastern Parkway. Though the custom by Chassidim is that the male visitors pass the room where the ladies sit and wish them words of comfort, when I again brought Rabbi Soloveitchik, we were ushered in. The Rav knew the family well from Berlin. As he was seated, the Rebbe and Rabbi Gurary, Chana's husband, also arrived. This time the conversation focused on the strong relationship that existed over the years between the fifth Lubavitcher Rebbe, Rabbi Sholom DovBer and Rabbi Chaim of Brisk, the Rav's illustrious grandfather. "The reason why the two families, the Lubavitchers and the Briskers, got along so well," the Rebbe said, "was because they both worked to reach the 'ultimate attribute of truth.'" Then the Rav began to talk about his student days together with the Rebbe in Berlin. He mentioned the difficulties they encountered in observing Torah and mitzvot. Someone else who was present in the room responded to the Rav's words mentioning the role that Rabbi Chaim Heller played at the time. Rabbi Chaim Heller's home was open to everyone who wanted to share a meal or to discuss spiritual matters. Both sages concurred and with this conversation our visit was concluded. Rabbi Joseph B. Soloveitchik (1903-1993) headed the Rabbi Isaac Elchanan Theological Seminary at Yeshiva University in New York City. He was a renowned Talmudist and philosopher, and authored more than fifteen books on Jewish law. The ten days staring with Rosh Hashanah and ending on Yom Kippur. Rabbi Heller headed the Beit Hamidrash Ha-Elyon Yeshiva in Berlin, Germany. The Rav was a scion of the famed Soloveitchik dynasty which headed the Brisk Talmudic academy. The Brisker Academy developed a unique method for understanding and interpreting the Talmud's intricacies. The mourner's prohibition to discuss words of Torah does not include areas of Torah which are considered "dejecting" — such as the laws of mourning. The 1/50 crop tithe which is given to the priest. The consumption of terumah is somewhat regulated, for example, it may not be eaten by a ritually impure kohen. Maimonides' magnum opus is his fourteen volume halachic work, Mishneh Torah (also known as Yad Hachazakah). Maimonides also authored other works, one of them being the Peirush HaMishnayot, a commentary on the Mishnah. Rabbi Kowalsky was the long time spiritual leader of Young Israel of Hillcrest, former vice president of Agudas Harobonim of America, active in the Rabbinical Council of America (RCA) and was on the executive board of the Council of Young Israel Rabbis in Israel. Excerpted from From My Zaidy's House by Sholem B. Kowalsky. Why Should We Be Deprived? Wow This is a beautiful and inspiring portrait of the relationship between two men of greatness. Studying in Berlin at the same time with the Rebbe was Rabbi Joseph B. Soloveichik, his students heard from him about the encounters with the Rebbe in Berlin. Three of his students tell of these encounters. Rabbi Sholom Kovalski recalls of taking Rabbi Joseph Ber Soloveitchik to visit the Rebbe in 1964. During the drive home, Rav Soloveitchik shared some personal recollections of the Rebbe, from their time together in Berlin. Rabbi Sholom Kovalski shared a close relationship with Rabbi Joseph Ber Soloveitchik. Here, he recalls taking Rav Soloveitchik to visit the Rebbe upon the passing of the Rebbe’s mother, Rebbetzin Chana Schneerson, of blessed memory. Rabbi Hershel Schacter, former president of the Rabbinical Council of America, tells of coming along with the Rav, Rabbi Yosef Ber Soloveitchik, to visit the Rebbe in 1980. © Copyright Jewish Educational Media All rights reserved.